“Arrive at your wedding in style"
Picture a fabulous eight-bedroom mansion set within the lush tropical gardens of a private ocean view villa. The sea breeze is warm and the sky is a brilliant blue. Guests arriving at the villa are greeted with a chilled glass of fruity wedding punch, which you personally helped create the recipe for. 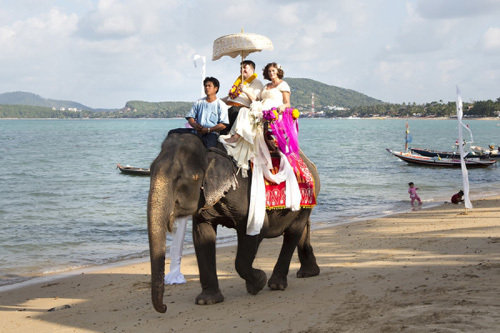 Next, you arrive at the wedding in dramatic Thai style – riding on the back of an elephant through the villa grounds, or even pulling up to the beach in front of the villa before the ceremony begins under an arch of tropical flowers. Friends and family gather round and the happiest day of your life begins. 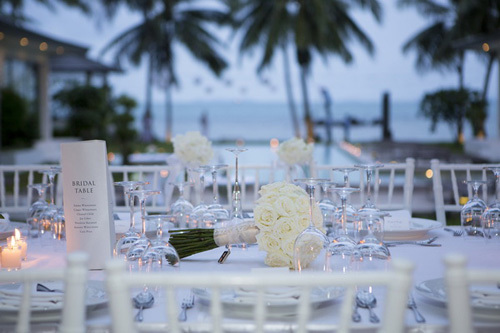 One of the true benefits of getting married on Koh Samui is that your wedding can be as classic or unique as you want it to be. Couples can choose a religious or secular service, or can even opt for traditional Thai Buddhist wedding ceremony that sees the bride and groom blessed with good luck by chanting monks from the local temple. At a private villa, couples can make sure the wedding ceremony remains as personal as possible by selecting a location that’s hidden form passers by, whether on the beach, in the villa’s fragrant gardens or in the cool comfort of the property’s air-conditioned interior. Many brides and grooms-to-be also choose to personalise the ceremony by writing their own vows. Once the ceremony and wedding photos are over, the couple and guests will be ready for some delicious food. In a private villa, the pool or beachside gardens offer a perfect place to host a meal, and experienced chefs can prepare international or fusion menus to suit everyone’s culinary tastes. A delicious seafood barbecue is also a popular option for those that prefer a less formal wedding feast. When marrying in Thailand, a lot of couples want to add an element of local culture to their wedding day and one of the best ways to do this is with a traditional Thai buffet. A delectable selection of spicy soups, creamy curries and crisp salads are all on the menu and sure to plead the hungry throng. For many guests, fabulous entertainment is what makes their wedding unforgettable and at a private villa it’s easy to manage a series of moods through the day. To create a low-key, relaxed atmosphere early on, guests can be serenaded by an acoustic guitarist during the meal. Then, when the food has been cleared away, a professional DJ or even a live band can help get guests into the party mood. 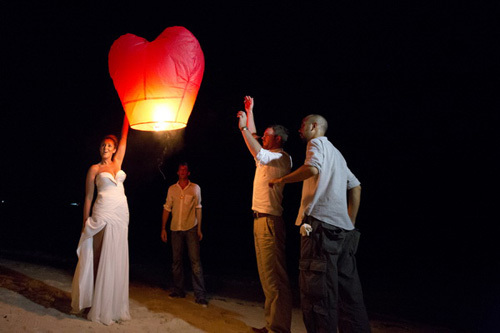 Once night has truly fallen and the stars are in the sky, the bride and groom can lead their guests down the beach to take part in one of Thailand’s most cherished wedding traditions – the release of glowing lanterns into the sky. After each guest has released their own lantern and best wishes for the couple, a colourful fireworks display is one of the best ways to round off a truly splendid wedding day.